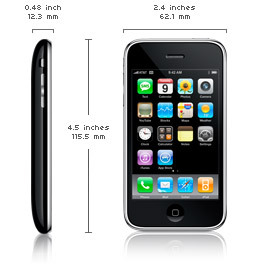 The 3G Apple iPhone will be released at 8 AM on Friday July 11th 2008. Below are the spces and technical details of the device itself. Answer iPhone calls wirelessly with this compact, lightweight Bluetooth headset. A single button lets you answer and end calls easily. And the lithium-ion battery delivers up to 5.5 hours of talk time and up to 72 hours of standby time. With a MobileMe subscription, you have everything you need, anywhere you are. Your email accounts, calendar, and contacts stay up to date on your iPhone and your computer. Automatically.